So, I’m sure like everyone else, I’m completely addicted to Pinterest! If you don’t have a Pinterest account then you’re saving a ton of time every day! Anyway, I saw this adorable kitchen stand on Pinterest and decided that I wanted to make one for my kitchen. I hurried to the Dollar Tree but they didn’t have any candle sticks that were tall enough so…..
Yep, that’s right, I used a wine glass! And how fitting is a wine glass in the kitchen?! 1. Spray primer all over plate and wine glass, let dry completely. 2. Paint plate and wine glass desired color. I mixed CraftSmart’s Olive Green with Delta Creative’s Pearl Finish Ceramcoat because I thought a pearlized finish would be pretty- and I was RIGHT! 3. You may need a couple of coats. 4. Now, if you want to add the fabric to the plate like I did… just cut the desired shape and use Modge Podge to attach it to the plate. Make sure that it doesn’t lift anywhere along the edge while it dries. 5. Use the glue gun to attach the plate to the wine glass. I found that by turning the wine glass upside down the stand will be more stable. 6. 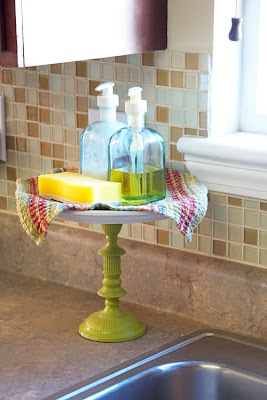 Cover entire piece with a thin coat of Envirotex Lite to protect it from water from the sink. If you’ve never used Envirotex Lite before it is AWESOME… but you have to be very careful with it as it likes to bubble up (use the flame of a lighter to remove bubbles while it’s drying), it likes to drip (make sure you brush off the drips before it dries or else it will look weird), and it takes several days to fully dry. But, when you’re done it looks like you dipped your item in glass. Note: I haven’t done the Envirotex Lite on this piece yet because I’m going to do several pieces at once. I’m really loving this paisley fabric! Definitely going to have to find other stuff to do with it! Did you see this adorable kitchen set I made! I made on of these for my bathroom to hold my hair products. I used a pedestal cake plate! Works great!! I love having these to keep stuff corralled! Love the green and paisley!!! Thanks SO much for sharing at the Kiss Me I’m Irish linky party over at I Gotta Create!